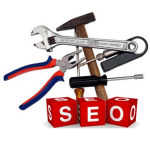 SEO Tools. Website Grader is another of the SEO Tools you should use to check your sites SEO. What the SEO tool does is analyze your site and give you a grade and a report on how to improve your sites Search Engine Optimisation. If you follow the recommendation’s you will improve your SEO and move up in the search results. When you make a website its a good idea to find SEO tools to analyze your site. One of the best SEO tools that you could use is from HubSpot, it will give you some ideas on how to improve your Search Engine Optimisation. HubSpots SEO Tool will give you a report that is broken down into three different sections. The SEO Tool will check to see if you have a blog, how easy it is for visitors to find the blog. How regularly you blog and if your blog articles are unique. Do you have a RSS feed. Does your blog get likes on Facebook and do visitors Tweet your posts. Then it looks at your website SEO and reports how many of your pages are indexed in Google. It gives you a score out of 10 for your SEO and tells you how many other sites are linking to your site, and gives you up to 25 links of the sites that are. It looks at Facebook likes and Twitter tweets and tells you how many likes and tweets your homepage has. Their website grader gives you insight to how your SEO is, as you make a website keep checking to see how your grade is, your website rank on search engines, how many pages are indexed and lots more. The Website Grader will give your website a grade out of 100 for your site. This means of the millions of websites that have previously been evaluated on the website graders algorithm your score will be calculated and you can see if your results ? ?% scores are higher than any of them in terms of its marketing effectiveness. The algorithm uses a proprietary blend of over 50 different variables, including search engine data, website structure, approximate traffic, site performance, SEO and lots more. If you want to improve traffic on your site then as you can see by the SEO Tools report its very important to have your website set up correctly with a blog, to help promote your site. Facebook fan page so you can post your links on it for fans to see, they can then make comments and like your posts. Have a Twitter account and tweet your latest posts. Google+ is also a great way to promote your site and every time you do a post other members can see and follow your posts. What is also important is that every time you post your link on Facebook, Twitter, Google+ and your blog you give your site another free back link helping your off page SEO. Every web page has the potential to rank well in search engines and draw traffic from other sources, like social media sites and the blogosphere. Of course, whether a page draws traffic (and links) depends on whether it’s optimized and how remarkable (useful, interesting, etc.) it is. But in general, most pages do “OK” and contribute to the cause, so it’s both a quality and a quantity game. You should always be on the look out for SEO tools. The good ones you bookmark and use them on any new pages you build. If you have found some good SEO tools please let us know in the comments below.